Israeli soldiers abducted, earlier Wednesday, four Palestinians, from Hebron governorate, in the southern part of the occupied West Bank, and inured one after repeatedly assaulting him. The soldiers invaded Beit Ummar town, north of Hebron, searched homes and abducted Mahmoud Suleiman Ekhlayyel. 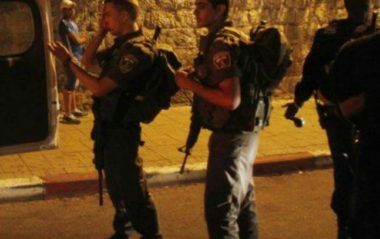 The soldiers also invaded homes in Yatta town, south of Hebron, and abducted Mohammad Jibreel Salama. Another Palestinian, identified as Baha Ghneimat, was taken prisoner in Surif town, northwest of Hebron. In addition, the soldiers invaded the al-‘Arroub refugee camp, north of Hebron, and abducted Maher Abu Warda, from his home, in addition to firing gas bombs and concussion grenades at local protesters. Furthermore, the soldiers abducted Firas Mohammad al-Baw, from Halhoul town, north of Hebron, while working in occupied Jerusalem, causing many cuts and bruises, before releasing him at Tarqoumia roadblock, west of Hebron. The Palestinian was instantly moved to the Hebron Governmental Hospital for treatment, suffering moderate wounds. It is worth mentioning that the soldiers invaded many neighborhoods in Hebron city, and installed roadblocks on the main entrances of Yatta, Ethna, Doura, Deir Samit, Beit Awwa and Halhoul, in addition to Hebron’s northern road, before stopping and searching dozens of cars, and interrogated many Palestinians while invoicing their ID cards. In related news, the soldiers abducted at least nine Palestinians, including former political prisoners, from their homes, in Ramallah, Jenin, Nablus and Bethlehem, in the occupied West Bank.